"More and more people are getting excited about the opportunity of what PCs can do for them in their living rooms to improve their entertainment experience." That was the message I was getting as far back as 2005, as companies including AMD, Intel, Microsoft, and yes, even Sun were exploring form factors for "entertainment PCs." Soon, we'd be seeing brands like Intel Viiv, AMD Live, and Microsoft TV at a store near you. It's five years later, and reality has officially set in. "Most people, from a consumer perspective, would not like to have a PC in their living room," said Irena Andonova, the director of product management for Windows Embedded 7 at Microsoft -- the company where entertainment PCs were once all the rage. Today, with HDTV manufacturers embedding Internet connectivity and versatile functionality directly into their sets, the PC is just one more box. Microsoft realizes that now, so with Windows Embedded 7 -- which released to manufacturing Tuesday -- it's aiming to put the operating system and the media player in the TV where it now says they belong. "Making Windows Media Center available in specialized devices like set-top boxes and connected media devices, we now have devices that can live in the living room, and customers will be accustomed to having them there. It brings the same functionality and features from Windows PCs to the world of specialized devices." Historically, the market for Windows Embedded has been industrial system makers, who build high-quantity or ultra-small form factor devices that need full-featured applications. And in recent years, the company has marketed Mediaroom, rather than Windows per se, to video service providers as an adaptable software platform for delivering cross-platform digital media. At CES 2010, Mediaroom actually stole the show from Windows 7 among device manufacturers. The new play for Windows Embedded Standard 7 will be to effectively wedge all of Windows into some of Mediaroom's market space. With it would then come Internet Explorer, custom applications, and yes, Silverlight. As Andonova told Betanews, OEMs and platform customers looking to embed the new operating system can use Silverlight as their development platform for customized apps that can appear as part of the Media Center environment. It's a somewhat familiar looking place, especially for users familiar with Windows Media Center today, as well as the company's overall look-and-feel for media-driven platforms such as Zune and Windows Phone 7. But as a Microsoft demo indicates, some components of that look and feel may be customized by platform customers, so that it's not Microsoft's branding that comes through -- a lesson learned from Mediaroom. "Windows Media Center is a customizable and extensible platform, so [OEMs] can actually customize the Media Center UI to provide the branding that they would like. They cannot change the horizontal and vertical menus -- they can't change that paradigm -- but they can change the font, the background, and the branding," she told us. One early adopter of Windows Embedded 7 for digital home media libraries, Microsoft tells us, is Swiss media device manufacturer Reycom. It's expected to produce its first Win7-based device (pictured above) in a few months. Andonova said Reycom's take on the Media Center UI is "very modern, very sleek, very nice looking, something that you would expect to find sitting in a modern living room." One of those customizable areas will be the movie library (shown above), which could theoretically become customized by potential customers whose names Microsoft couldn't help but share...including Netflix. "Service providers like telecommunications companies, satellite and cable providers, what Windows Media Center and Windows Embedded Standard 7 offers is the opportunity to provide incremental, over-the-top content. We have demonstrated different services, like Netflix and combining videos from local sources and the Internet, bridging the experience between the Internet and broadcast, or viewing your pictures and photos on Standard 7 and merging Flickr, for example, with personal photo libraries...There can be different, additional revenue potential for service providers, by providing these incremental, over-the-top services." Or to break that down another way: Cable and satellite companies could find additional revenue streams by funneling customers to Internet-based services. But to do that in such a way that viewers aren't being transported to the Web browser/PC operating system world they might rather leave at work, Web apps need to become channels -- things that viewers can tune in on their dials. Nevertheless, because Web apps come and go, and change, more rapidly than the firmware in most set-top boxes can keep up with, the operating system needs to be able to install these apps and uninstall them just like on a PC. 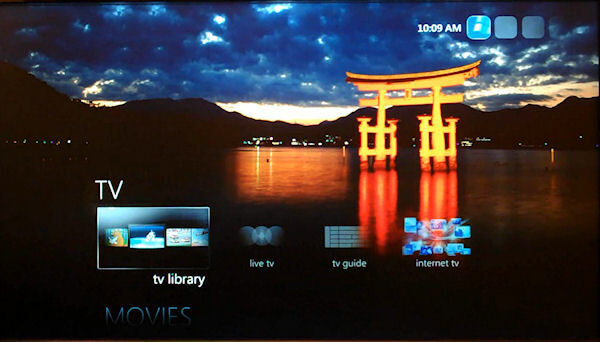 Thus the creation of an extensible Windows Media Center on a real Windows operating system, but without the PC, embedded in the back of the latest HDTVs as well as the newest DVRs and home media devices like the one European customers should see from Reycom in the coming weeks.